This article will look at some of the different ways that you could heat your pool and explore some of the advantages of each method. What temperature should my pool be heated to? The temperature that you set your pool thermostat to is of course a matter of personal taste, but there are basic guidelines for different pool uses. An average family pool is normally heated to about 28 °C. For competitive training and fitness swimming it should be a little cooler at 27 °C and, if young children or the elderly are using the pool then they will be more comfortable at between 29 – 30 °C. Whatever temperature you choose, a heat retention cover will keep your fuel costs down and your pool temperature up. An electric pool heater works in the same way as a kettle or emersion heater. An element or elements heat the water around them as it is pumped through the heater. Electric heaters are clean and are often set to work on the ‘Economy 7’ tariff, however a large pool will obviously take more heating and a very large pool require 3-phase power. Just like a domestic gas boiler, gas pool heaters must be installed and serviced by a Gas Safe Registered engineer. (What used to be CORGI.) There are also regulations concerning the size and position of the flue, ventilation and the gas supply. Gas heaters may be fuelled by either natural gas or propane. In either case, a gas heated pool is probably a little cheaper to run than one heated by electricity. Gas heaters are well protected by safety devices that respond to a pilot-light failure, overheating or the pool circulation pump failing. Oil heaters have been used to heat swimming pools for many, many years. The oil heater can either be your main house boiler with the heat exchanger added to the system just like you would add additional radiators, or as a separate boiler just for your pool. If you are planning on running a separate boiler for your pool then don’t forget to ensure that oil can easily be delivered to it’s dedicated oil storage tank. Flue and ventilation requirements are for the safe running of an oil heater but at present are not covered by direct legislation. A heat pump works on the same principle of heat exchange as your fridge does. 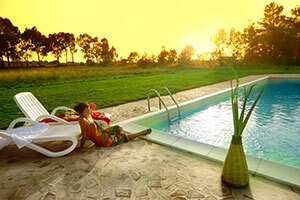 When used as a pool heater, the heat pump pulls warmth out of the air outside and transfers it to your pool. Heat pumps are extremely efficient and ‘multiply’ energy, so for every unit of electricity you pay for to run the heat pump you get four to five free units to heat the pool water. However, heat pumps do need the filter pump to be running in order for them to work and they can only generate a relatively low amount of heat, so to heat the pool at the beginning of the season you have to run the heat pump and the filter pump constantly until the desired temperature is reached; after that the running time can be cut back but it’s important to have a heat retention cover on the pool to conserve the heat. Economically priced and suitable for all types of outdoor swimming pool, DURA and DURA+ heat pumps are suited to UK climate with the DURA+ able to provide all year heating capability and show a significant saving on energy bills. Modern solar-thermal tubes and panels are very efficient, however you need to bear the UK’s climate in mind before choosing them and remember that they do need an electrically driven pump to work. Solar panels, like the heat pump, deliver fairly low amounts of energy so your pool will take some time to heat up at the beginning of the season. Standard pool solar collectors require a bank of panels equivalent to about 75% of the surface area of the pool, they should face South if that’s possible and be angled to face the sun. In the main, solar panels aren’t used as a pools only source of heating but they can make an impressive difference to the cost of running a pool over a season. As you can see, there are many different ways to heat your pool. If you would like some specific advice then we can help you find a pool professional with the appropriate skills and experience right for you. There is a link at the top of this article that can get that process underway.